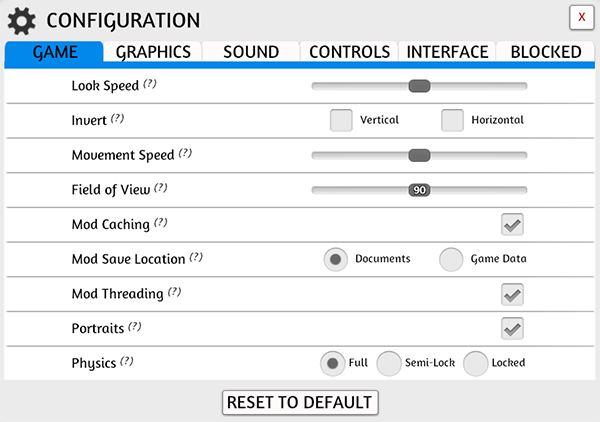 One of the first things you want to do is to set up your graphical and game settings how you want. There are question marks (?) throughout the menu, so be sure to hover over them to read more about what each section does. Please note that when we add new controls or make any changes to existing controls, settings do have to be reset, so you will have to redo any changes you have made. In this tab, you can adjust the look speed, adjust your field of view, choose where your mods are located and decide whether you want Steam portraits to show up or not. As the host, you can also choose the level of physics you want to play with. Keep the Threading box checked to speed up the loading process of mods and not have the camera hard lock on you. However, this may not work for all systems, so if you are having issues and this is checked, try unchecking it, save and try loading the mod again. 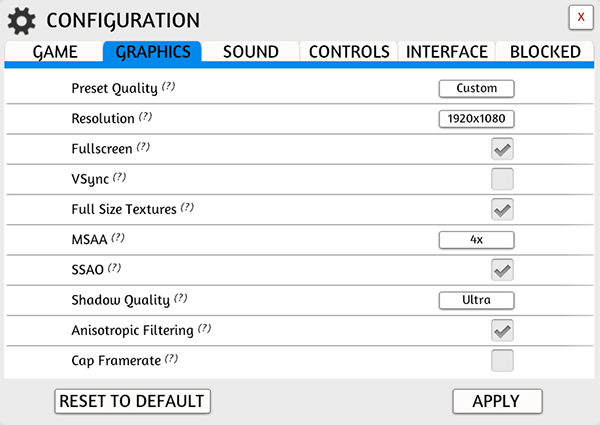 This is where you modify your graphical settings. If you are having issues with mods crashing your game, you can try unchecking Full Size Textures. Otherwise, you can try lowering your Preset Quality. Play around with the different settings (read the tooltips!) to see what works best for you and your system. 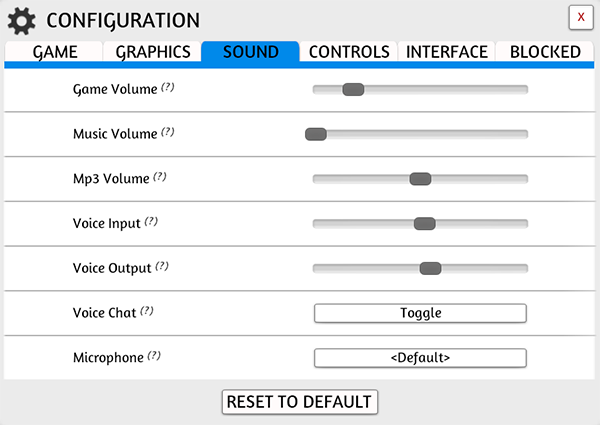 You can adjust the overall game volume, the main menu music, voice chat volume and choose what microphone you use. This is where you can change your keybinds. Most options are available, but currently the Function keys cannot be modified. 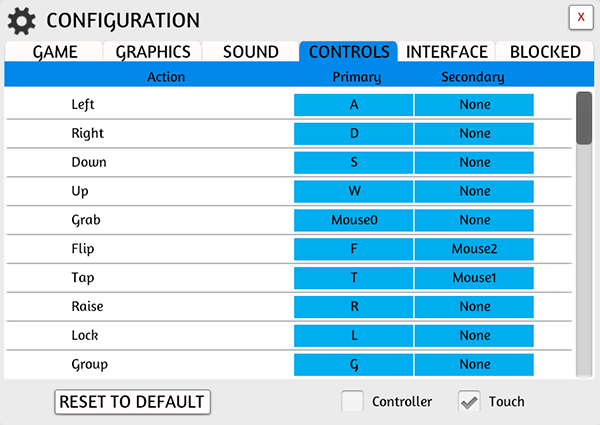 You can check the Controller box if you wish to use a controller (off by default) or check the Touch box if you wish to enable touch features. In this tab, you can choose which menu items you want visible on screen. This is good when you want a clean game without all the menu options or when streaming. To remove the entire UI, you can press F11. Keep in mind doing it this way, you will not be able to see tooltips or the contextual menu. You can also choose which pointer you’d prefer to play with. The default is the 2D pointer which is a hardware pointer so it isn’t tied to the FPS the game is running at (Great for lower end systems). If you prefer to choose the 3D Pointer, you can do so here. Other players will only see the 3D pointer regardless of which pointer you choose. The Kickstarter pointer is reserved for those who backed at specific pledge levels and is not available for purchase. When you ban someone from your game, or block a name on the server browser, they will show up in this list. You can then just click on their name in the Block list to remove them. When you ban or block someone, you will never see their name on the server browser and they can not join your games unless you unblock them. 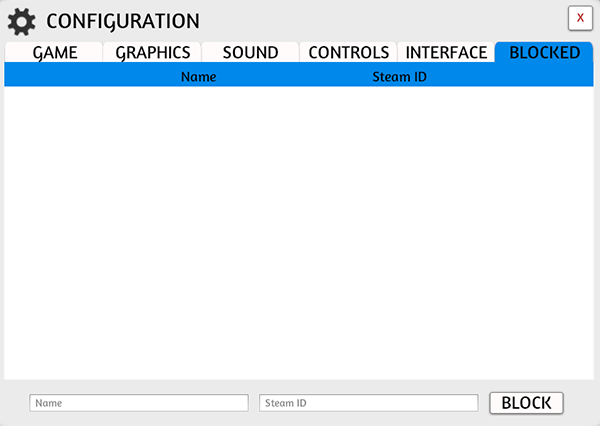 You can also manually add them in by inputting their name and Steam ID. You can read more about Block Lists and other ways to block people and servers in this article.